I’ve wanted a better iron for a while. I had a good one when I was at university, but shortly after I started sewing I dropped it and it never worked again. I hastily replaced it with something cheap and cheerful which I have been using ever since. It probably says something about its age that it’s styled to look like an early iMac – all white and blue translucent plastic. Anyway it worked. In fact it still works – at least it heats up. It just can’t steam. I don’t remember dropping it, but one day in November it poured water all over the ironing board when I started to use it. As soon I looked at it closely I saw the water tank had cracked. I managed for a while by not putting any water in the iron. I made steam by dampening my fabric with a spray bottle of water, which I can’t recommend. It works but it’s easy to get the fabric too wet. This is what I got for Christmas. Might seem silly to get excited over an iron, but this one is so much better than my old one. It produces loads of steam, it has a really long cord, and it hasn’t dripped once so far. And it’s red. Everyone knows red ones go faster, right? 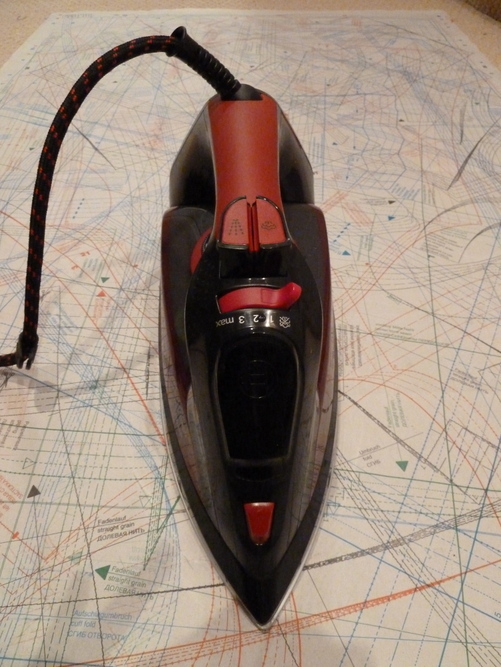 If anyone’s really interested it is a Bosch Sensixx’x DA50 Edition Rosso. Sounds more like a sports car than an iron. Cleaning the sewing machine is a never-fail way to kickstart the sewing mojo. Cleaning and threading the overlocker, even more so. Clearly I haven’t been lacking in mojo lately because ewww. 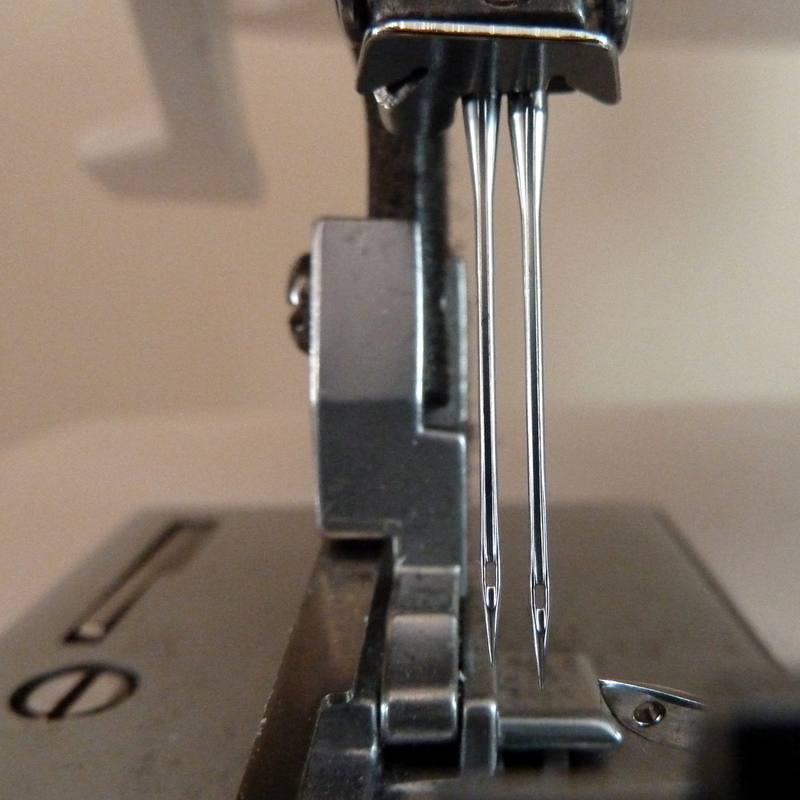 I wanted to switch from three to four thread mode on the overlocker which meant inserting a second needle. I have trouble getting needles into this overlocker correctly. I sometimes even have a needle slip out while sewing because I haven’t tightened the screw enough. And this time, something seemed obviously wrong because when I put the second needle in the eyes didn’t line up. No mention of this in the manual. No amount of undoing and redoing, trying different needles, or fiddling with the screws made the slightest difference. Eventually I resorted to the Internet. And apparently they’re not meant to line up! How have I never noticed this before? Is it weird to prefer your backup machine? When I started sewing I did lots of research about picking a machine. I knew I wanted something I could sew heavy fabrics on, and that I wouldn’t grow out of quickly. Various websites recommended getting one with a one-step buttonhole and stretch stitches for sewing knits. I ended up with an Elna 3210 which felt like quite a fancy machine for a beginner. I sewed away happily on it for nearly four years. I sewed knits, denim, and coating fabric and it managed them all. It didn’t get an annual service but I really looked after it; it got a thorough clean and a new needle for each project. But last year the Elna’s tension started to behave oddly and I finally had to get it serviced. Round here this takes at least a couple of weeks. 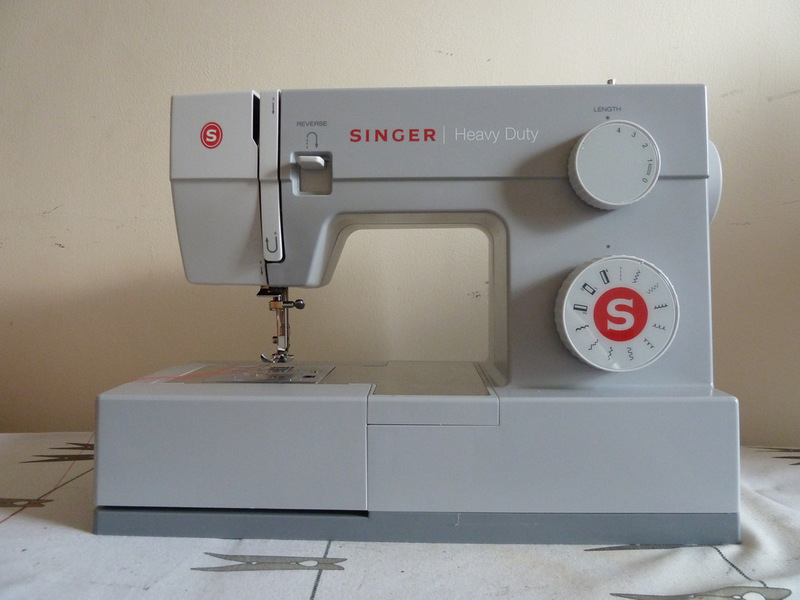 I couldn’t bear to be without a sewing machine for that long so I got a more basic backup machine, the Singer Heavy Duty below. No stretch stitches, no one-step buttonhole. The only feature it has that the Elna doesn’t is the ability to move the needle right as well as left. It’s picky about bobbins, unlike the Elna, and not very good at winding them evenly. It’s also harder to clean. But where the Singer shines is that it’s really fast. 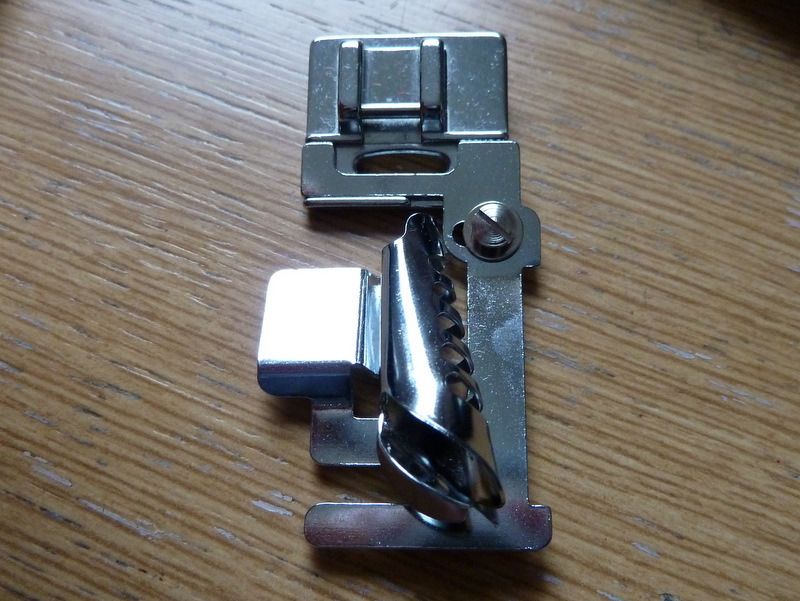 I discovered I actually prefer a four-step buttonhole to a one-step. And as I’d acquired an overlocker not long before, I didn’t miss the stretch stitches. When the Elna came back from being serviced (with a brand-new tension assembly) I thought I’d probably alternate them. But gradually the Elna’s been used less and less. I got it out to sew my current project because I had an idea that the slower machine would cope better with very flimsy fabric, and realised I’d forgotten how to wind bobbins on it. After three failures I resorted to the instruction manual. It seems a bit odd that I prefer sewing on the more basic machine. 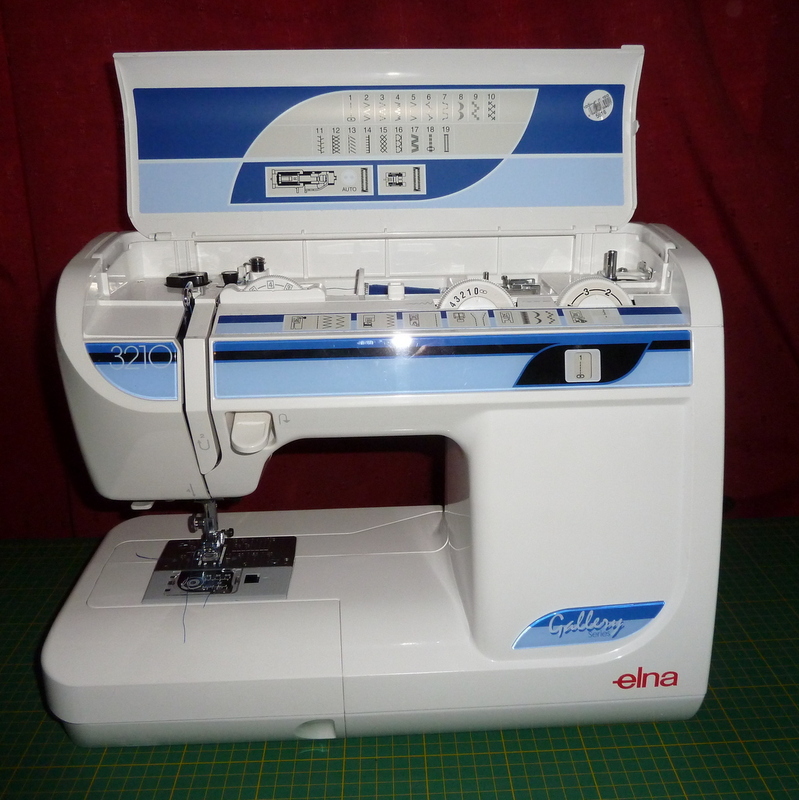 And I’m still really glad I started sewing with the Elna; it has much better instructions than the Singer and it enabled me to sew knits long before I could contemplate an overlocker. If I had to cut down to only one machine it would definitely be the Elna I’d keep. What do you look for in a sewing machine? I’m never quite sure how often to change the needle on the overlocker. 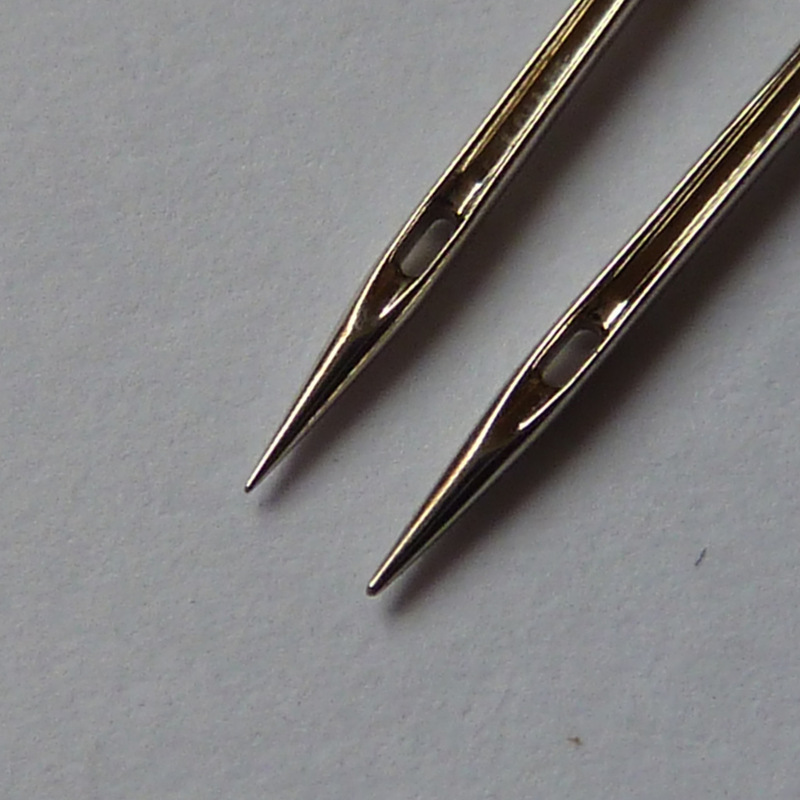 I change the sewing machine needle for most new projects, but I’ve been using the same overlocker needle for a while. The tension on the overlocker was being more than usually temperamental recently so I decided to treat it to a new needle. When I got the old needle out and had a good look at it I realised I should have done that a long time ago! 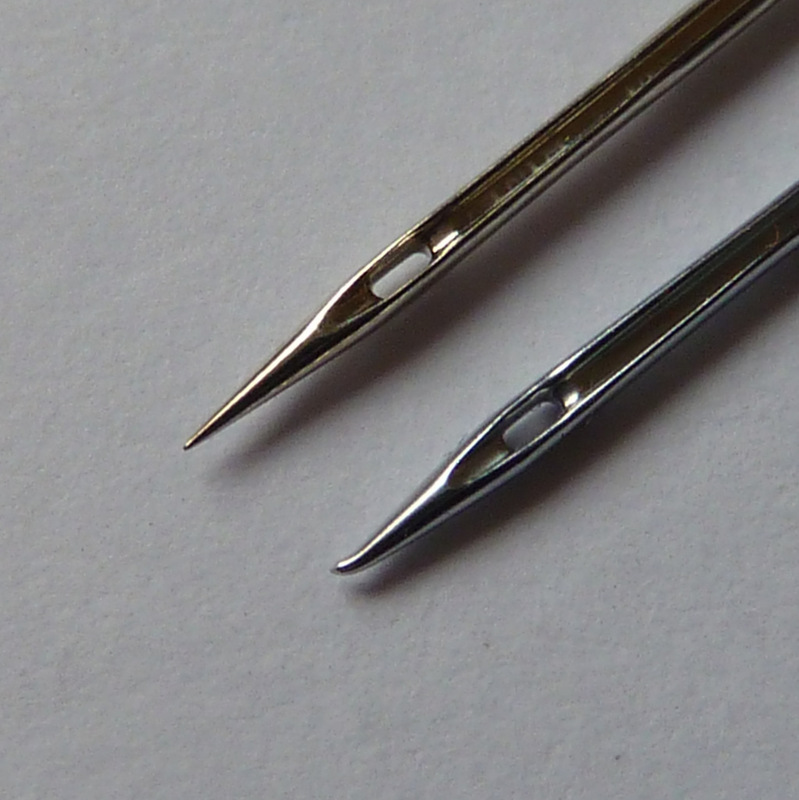 In the picture below the needle from the overlocker is the one on the bottom and the top one is a brand-new universal size 90. No wonder things weren’t quite right. Here’s the universal needle next to a new stretch needle. That’s more like it. After the change of needle and bit more fiddling with the tension the overlocker is working smoothly again. Phew. Thank-you all so much for the suggestions about accessorising the peacock print dress. I’m going to have to do some shoe shopping, such hardship! 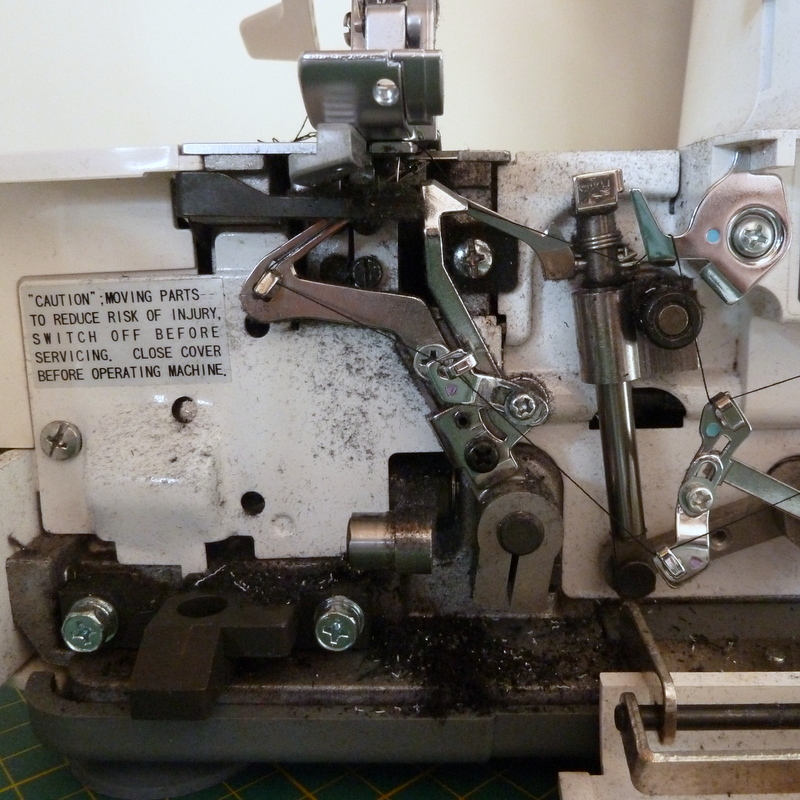 For a long time now I have been putting off having my long-suffering Elna sewing machine serviced. The only place it can be done locally only services machines on a few days a week and always has a waiting list, and I can’t bear to be without it for the week or two it will take to put it in the queue and get it done. But it really does have tension problems. And I recently got paid for some teaching I did last term. So I bought this. It is exactly what I wanted in a backup machine. It’s a lot more basic than my main machine – no stretch stitches or one-step buttonhole – but it’s fast and it has the one feature I find the Elna lacks, which is that the needle position can change to the right as well as the left. And the feet and bobbins seem to be compatible. I took the Elna’s feet into the shop to try them out on different machines just to make sure. I’ve sewed a little with it so far, and apart from the fact that the presser foot lift’s in an unexpected place I’m getting on well with it. Now I just have to haul the Elna in to the shop – I’m glad it has a sturdy case! This little thing is magical. It’s a binding foot. I’ve had it for a couple of years but never got round to using it until this week, when I realised I was going to have to bind fifteen metres of raw edges on my mother’s kimono. 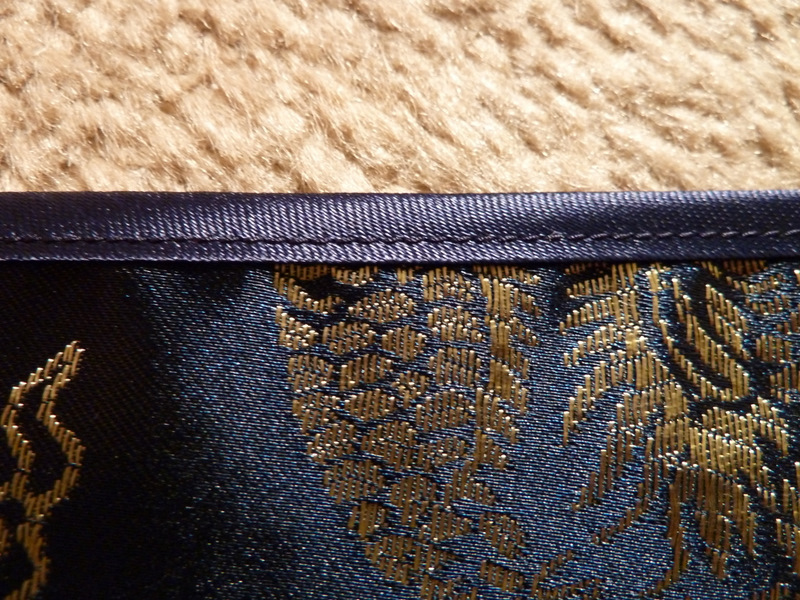 I’d normally use a narrow hem for this, but that clearly wasn’t going to work with the poly brocade fabric we chose. It ravels as soon as you look at it. The edges show so binding it had to be. 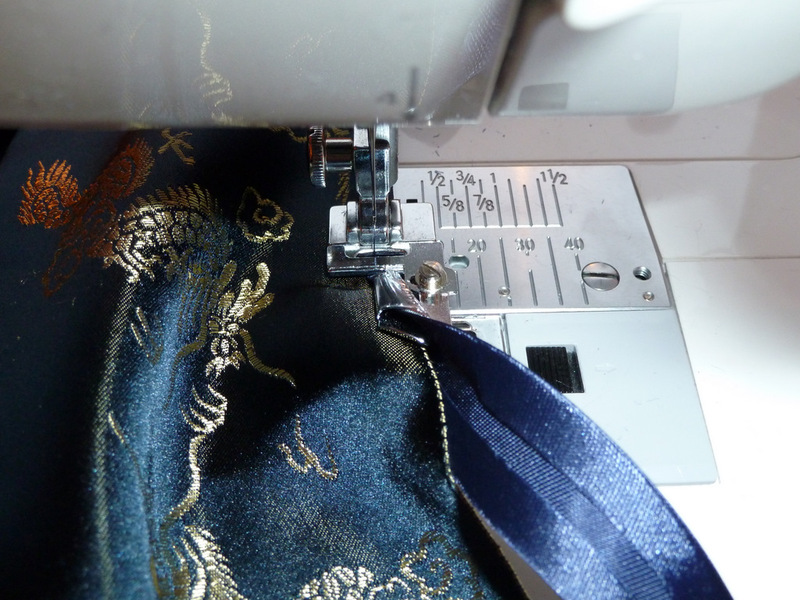 I armed myself with a large roll of satin bias binding and the binder foot instructions. I am a girl racer on the sewing machine. I like to sew as fast as possible. This is probably the reason why I’ve never had great success with my rolled hem foot, which requires slow and careful feeding. Not so with the binder foot. It takes care of feeding the bias binding correctly all on its own. I just sat there keeping the cut fabric edge aligned with the foot and the pedal right down. Here it is in action. The end result is pretty good. Right side. Wrong side. I think if I was doing this again I’d probably reverse the fabric and feed it wrong side up to get the slightly narrower edge on the right side, but I’m still really pleased with the results. Of course it wasn’t perfect from the start. I found the hardest thing was figuring out how to start and stop neatly – something the instructions that came with the foot didn’t mention at all. I had most success when I started by sewing just the binding with no fashion fabric. After a few stitches I stopped and inserted the fashion fabric into the foot, pushing it all the way to the point where the feed dogs would catch it. A tapestry needle was a great help for that. 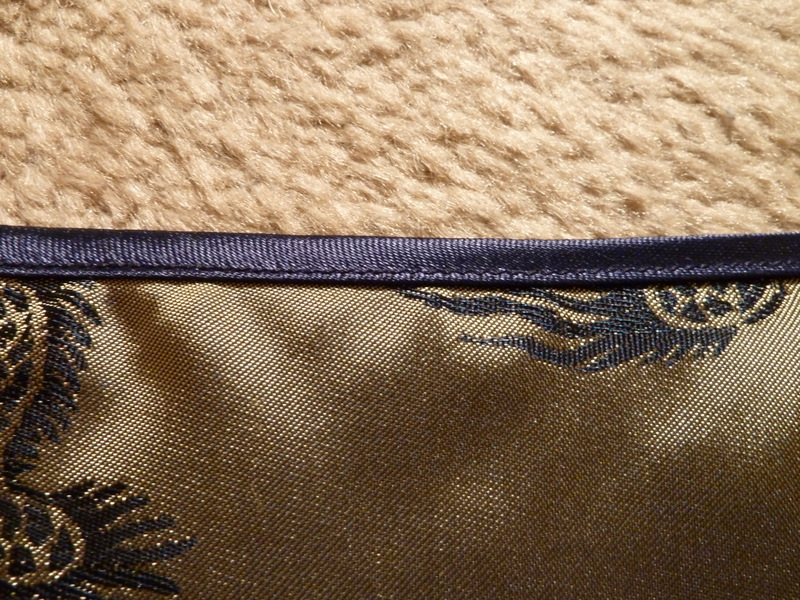 At the end of an edge I found the best thing is to keep sewing right off the edge of the fabric. The foot is then sewing the binding together with no fabric between. Then cut the binding off behind the foot, insert the next edge at the front, and start sewing again. The bound edge has a tendency to pucker slightly. A good press afterwards seems to help with that. Now onto the assembly of the kimono. My sewing machine’s not happy. The tension’s been slightly off for a long time, but recently it’s got a lot worse. For a long time I thought the problem was the needle tension, which I keep having to turn up higher to get even stitches. But this week the bobbin started rattling and sticking. The thread broke. And every so often, the bobbin tension went really tight and everything jammed until the scissors came out. I guess it really needs a good service. Obviously there comes a point where faithfully cleaning it after every project and changing the needle just isn’t enough! 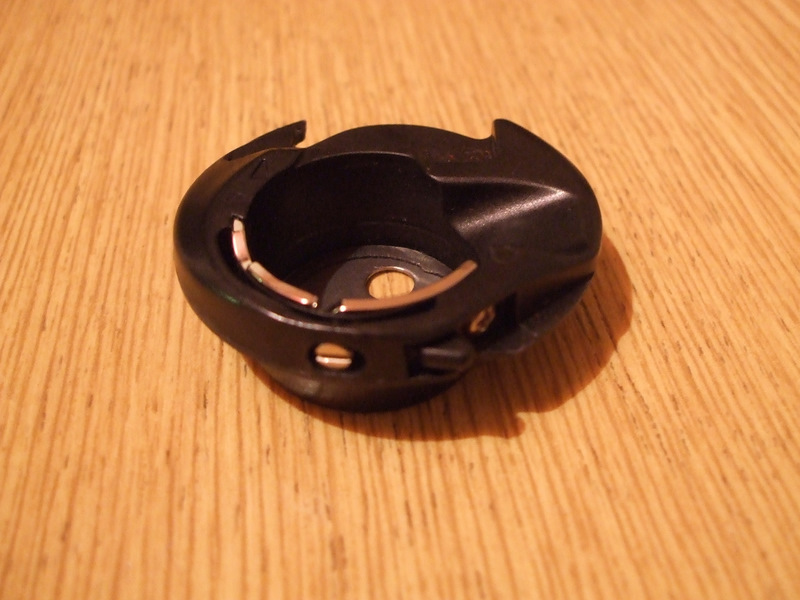 I think the problem might be something to do with the bobbin holder. See that tiny little screw at the front? You aren’t supposed to adjust it, but according to the Internet it controls the bobbin thread tension. The machine was behaving so badly on Monday I gave it a tiny tweak to loosen the tension, and that helped. It’s not as good as new but it hasn’t jammed since. I’m hoping this will be enough to keep me sewing through the Christmas break. I will get it serviced after the holidays. Honest.